Veterans for Peace mural (detail), 2017. (NEW ALBANY, Ind. )—IU Southeast has a new monument. The Veterans for Peace mural currently hangs in the University Center South, and will be officially celebrated on Tues., Sept. 26 at 5 p.m. 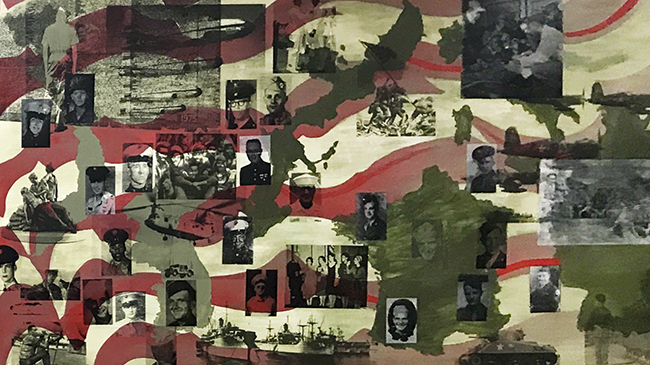 The large-scale, original artwork combines veterans’ portraits and keepsake photos with images of iconic monuments and events to honor the roles military service personnel have played throughout the 20th and 21st centuries. Local and student veterans worked with Susanna Crum, assistant professor of fine art, and Mariana Grohowski, assistant professor of English, to create the mural during the summer of 2017. Grohowski, whose father is a veteran and whose research centers on veterans studies (she founded the Journal of Veterans Studies, the first scholarly journal dedicated to this field), initiated the process that led to the mural last year. She contacted Ehren Reed, outreach programs manager at Louisville Visual Art, a nonprofit dedicated to improving lives through visual art education, community outreach, and artist support, to explore possible collaborations around veterans themes. Coincidentally, LVA had been contemplating something in this direction. Reed had what she calls a “light-bulb moment,” and created a proposal for a crowd-funded ArtsMatch grant through the Fund for the Arts that would support a “Veterans for Peace” mural project. The proposal partnered IU Southeast student veterans with the Kentucky chapter of the National Association of Black Veterans and Peace Postcards. The proposal garnered enough support from the community to enable two projects, one in Louisville and one that would become the Veterans for Peace mural at IU Southeast. Grohowski reached out to veterans on campus and in the community, to solicit stories, photographs and other artifacts of military service, and to invite veterans to participate in the creation of the mural. Images began to arrive via Google Drive, Facebook and email, and workshops were convened to jointly brainstorm the project. On whiteboards, groups of students and community members sketched out various ideas, and eventually the concept of a timeline began to emerge as the central organizing principle. For Crum, these workshops were an integral part of the experience, as the veterans began to relate maps and photos to their own stories, to share these within the group, and to weave them into the texture of the emerging print. “Creating art in a collaborative setting can allow for a kind of open, relaxed conversation to take place, and the maps provided an opportunity for the veterans to point to, recall and share their experiences,” Crum said. Three local veterans stepped forward to design and complete the mural itself: Tony, Lonnie and Maurice Fetz of New Albany. Tony (Army) and Lonnie (USMC) served in Vietnam in 1967-68. Tony’s brother Maurice (USMC) saw peacetime duty in the Far East during the late 1950s. With Crum and Grohowski acting as facilitators, the three veterans hammered out a concept based on the American flag, overlaid with silhouettes of nations where other contributing veterans have been deployed, such as Iraq and Vietnam, and including their photographs. Moments and memories of those conflicts—helicopters taking off, comrades carried on stretchers, vintage tanks—are interspersed with the portraits and snapshots to fix the chronology and connect families, both veteran families and the larger family of the military, across generations. It was the veterans who suggested the flag as a background, and proposed having it fade as it moved back in time. They also wanted to make sure it was inclusive of all wars. “We wanted to make sure that, whatever it was, it covered what all vets went through,” Tony said. Part of that inclusion found representation in the silhouettes of countries where vets had served. True to their wishes, the countries remained without names and dates. “We wanted those people to be able to tell those stories themselves,” Tony said. Due to time constraints and the wealth of materials that the group had to work with, workshop time was spent arranging the photos and maps, and Crum transferred them to the panel on her own. 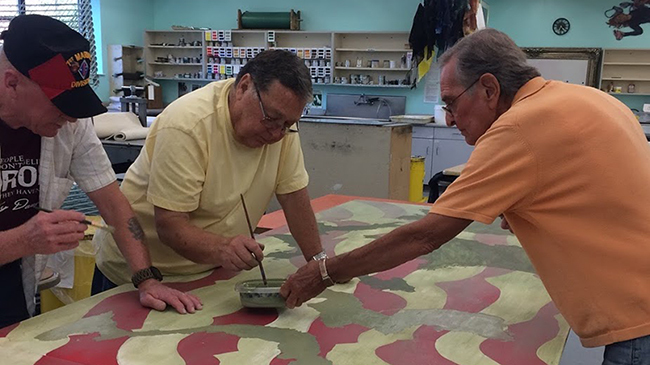 Lonnie, Tony and Maurice Fetz of New Albany, Ind., painting the Veterans for Peace mural. Photo by Mariana Grohowski. Crum believes that screen printing, with its ability to blend and unify across media, helped to solve logistical challenges presented by the different types of materials, but also to tell the story on a deeper level. For Reed, the project has succeeded in reinforcing community through art, and beginning a process of reflection and dialogue through shared creative endeavor. Grohowski is proud of the final product. Certainly the veteran voice has found expression, and a sense of place, in the mural. Maurice Fetz sees the mural as one more opportunity to get involved, which he is doing more and more of. His cousin Tony shares the sentiment.